German trench in the Argonne, which is protected with steel plates. Germans attack Marie Therese Work in La Grurie Wood (Argonne) and Ban-de-Sapt (Alsace), repulsed at both next day. 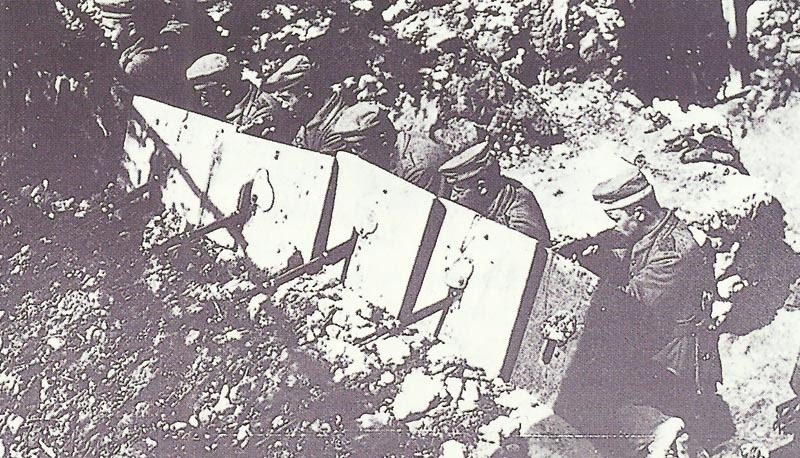 Champagne: French 60th Reserve Division mistakenly attacks Sabot Wood and loses 500 PoWs to German counter-attack. East Prussia: Eichhorn takes 10,000 PoWs, cuts Russian Kovno line of retreat. Mesopotamia: Half 12th Indian Brigade arrives at Qurna, half way to Ahwaz. Britain: Reply to US note of December 26, 1914 on neutral shipping interference. USA: Notes to Britain on illegal US flag use and to Germany (replies on February 16 and suggests US mediation) on U-boat blockade; latter to be held to ‘strict accountability’ if lives lost.